The Conference organisers have arranged for on-campus accomodation (at the "Residential Complex", at 90 University Private) at a highly discounted rate (note: at this early date, these prices are subject to change, but will give you a good idea of cost). Please make your own reservation on line http://www.ottawaresidences.com or by calling 1-888-564-4545. Important Notice: There is a cutoff date for rooms in residences that have been put on hold for the CGI 2011 conference. Rooms will be on hold until April 26th. Attendants interested in booking in the University residences are strongly encouraged to do so before the cutoff date. For participants interested in an off-campus accomodation, the conference organisers have made different arrangements for discounted price accomodation for CGI 2011 participants. A 10% rebate will be given for those CGI 2011 participants who book their hotels in Ottawa with HotelsCombined.com. The conference organizers have arranged a special rate for CGI 2011 attendants at the Extended Stay Deluxe Ottawa Downtown Hotel (opens in a new window). The rate goes for one bedroom suite with one King or two Double beds (depending on the guest choice): $119.00 per night. Guests need to ask for the group CGI'11 when booking. Important Notice: There is a cutoff date for rooms that are on hold for the CGI 2011 conference, wich is 30 days before the event. Attendants interested in staying at Extended Stay Hotels are strongly encouraged to make their bookings before May 12th. 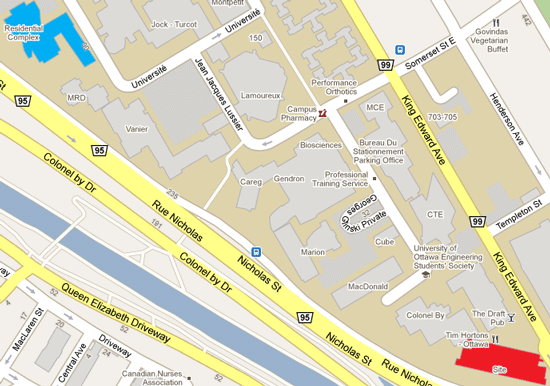 The following map shows the location of some of the hotels (marked in blue) nearby the School of Information Technology and Engineering (SITE) building (marked in red), as a reference.